This is a class for holding and sorting particle items. Class <T> must have a RealVect <T>position() const function which is used to assign the item in a list. See class BinItem for a base class for particles. Define function. Same as the full constructor. Get the BoxLayout on which this ParticleData. Removes all the items from all the boxes in the container. Return the number of particles in the container, outcast and valid. Return the number of valid particles in the container, not counting outcasts. Return the number of particles in the outcast list. Get the physical domain associated with this ParticleData. Get the mesh spacing associated with this ParticleData,. Get the origin of the coordinate system. Get the fixed Box size. 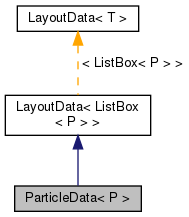 a_dp: The BoxLayout on which the particle data will be defined. Note that this *must* be a 'fixed size' layout. a_fixedBoxSize: The (fixed) box size in cells. a_domain: the problem domain, used for enforcing periodic boundary conditions. a_meshSpacing: the physical mesh spacing, used for binning the particles. a_origin: the origin of the coordinate system, also for particle binning. References ParticleData< P >::allocateVector(), ListBoxFactory< T >::define(), ParticleData< P >::m_factory, ParticleData< P >::m_fixedBoxSize, ParticleData< P >::m_isDefined, ParticleData< P >::m_meshSpacing, ParticleData< P >::m_origin, and ParticleData< P >::m_physDomain. Referenced by ParticleData< P >::ParticleData(). References LayoutData< ListBox< P > >::boxLayout(). Referenced by collectValidParticles(), ParticleBC::enforcePeriodic(), ParticleData< P >::fillGhosts(), ParticleData< P >::gatherOutcast(), readParticlesFromHDF(), ParticleData< P >::remapOutcast(), and writeParticlesToHDF(). References List< T >::clear(), LayoutData< ListBox< P > >::dataIterator(), ParticleData< P >::m_isDefined, ParticleData< P >::m_outcast, and LayoutIterator::ok(). returns the total number of particles in all the boxes it owns. References LayoutData< ListBox< P > >::dataIterator(), List< T >::length(), ParticleData< P >::m_isDefined, ParticleData< P >::m_outcast, ParticleData< P >::numParticles(), and LayoutIterator::ok(). Referenced by ParticleData< P >::numParticles(). Return the number of particles in the container, outcast and valid. This version does a parallel reduce to count all the particles on all processes. References broadcast(), gather(), ParticleData< P >::m_isDefined, ParticleData< P >::numParticlesLocal(), numProc(), and procID(). Referenced by ParticleData< P >::numParticlesLocal(). References LayoutData< ListBox< P > >::dataIterator(), ParticleData< P >::m_isDefined, ParticleData< P >::numValid(), and LayoutIterator::ok(). Referenced by ParticleData< P >::numValid(). Return the number of valid particles in the container, not counting outcasts. This version does a parallel reduce to count all the particles on all processes. References broadcast(), gather(), ParticleData< P >::m_isDefined, numProc(), ParticleData< P >::numValidLocal(), and procID(). Referenced by ParticleData< P >::numValidLocal(). returns the total number of outcasts it owns. References List< T >::length(), ParticleData< P >::m_isDefined, ParticleData< P >::m_outcast, and ParticleData< P >::numOutcast(). Referenced by ParticleData< P >::numOutcast(). Return the number of particles in the outcast list. This version does a parallel reduce to count all the outcasts on all processes. References broadcast(), gather(), ParticleData< P >::m_isDefined, ParticleData< P >::numOutcastLocal(), numProc(), and procID(). Referenced by ParticleData< P >::numOutcastLocal(). Return a reference to the list of "outcast" particles - a list with particles not currently associated with any box in the container. closed - i.e. is the outcast list empty? References List< T >::isEmpty(), and ParticleData< P >::m_outcast. After the particles have moved, they might not still belong in the same ListBox they started in. This function collects all the particles that are no longer in the right box and puts them in the outcast list. References ParticleData< P >::getBoxes(), and ParticleData< P >::m_outcast. Redistribute the particles in the outcast list onto the proper box and process. References CH_TIMERS, coarsen(), ParticleData< P >::getBoxes(), BoxLayout::index(), List< T >::isEmpty(), BoxLayout::layoutIterator(), locateBin(), ParticleData< P >::m_fixedBoxSize, ParticleData< P >::m_meshSpacing, ParticleData< P >::m_origin, ParticleData< P >::m_outcast, myrotate(), numProc(), LayoutIterator::ok(), BoxLayout::procID(), procID(), and Box::smallEnd(). Routine for filling ghost particles. This function will augment each ListBox in a_particlesWithGhosts with copies of all the particles that lie within a_numGhost cells of the box boundaries. If the problem domain used to define this ParticleData is periodic, then ghost particles will be grabbed from the opposite sides of the domain as well. Ghost particles that are copied from accross periodic boundaries in this fashion will have their position coordinates periodically shifted such that computing the distance between them and the "valid" particles will return the *shortest* distance defined on the periodic domain. References Box::bigEnd(), CH_TIMERS, coarsen(), D_DECL6, D_TERM6, BoxLayout::dataIterator(), ProblemDomain::domainBox(), ParticleData< P >::enforcePeriodic(), ParticleData< P >::getBoxes(), ListBox< T >::getInvalid(), grow(), BoxLayout::index(), ParticleData< P >::isDefined(), BoxLayout::layoutIterator(), locateBin(), ParticleData< P >::m_fixedBoxSize, ParticleData< P >::m_isDefined, ParticleData< P >::m_meshSpacing, ParticleData< P >::m_origin, ParticleData< P >::m_physDomain, numProc(), LayoutIterator::ok(), procID(), BoxLayout::procID(), Box::smallEnd(), SpaceDim, and IntVect::Unit. References LayoutData< ListBox< P > >::box(), DataFactory< T >::callDelete(), ListBoxFactory< T >::create(), LayoutData< ListBox< P > >::dataIterator(), MayDay::Error(), LayoutData< ListBox< P > >::m_callDelete, ParticleData< P >::m_factory, LayoutData< ListBox< P > >::m_vector, Vector< T >::resize(), DataIterator::size(), and Vector< T >::size(). Referenced by ParticleData< P >::define(). References Box::bigEnd(), CH_SPACEDIM, coarsen(), dim, ProblemDomain::domainBox(), ProblemDomain::isPeriodic(), ParticleData< P >::m_fixedBoxSize, ParticleData< P >::m_physDomain, and Box::smallEnd(). Referenced by ParticleData< P >::clear(), ParticleData< P >::gatherOutcast(), ParticleData< P >::isClosed(), ParticleData< P >::numOutcastLocal(), ParticleData< P >::numParticlesLocal(), ParticleData< P >::outcast(), and ParticleData< P >::remapOutcast(). Referenced by ParticleData< P >::define(), ParticleData< P >::enforcePeriodic(), ParticleData< P >::fillGhosts(), and ParticleData< P >::physDomain(). Referenced by ParticleData< P >::define(), ParticleData< P >::fillGhosts(), ParticleData< P >::meshSpacing(), and ParticleData< P >::remapOutcast(). Referenced by ParticleData< P >::define(), ParticleData< P >::fillGhosts(), ParticleData< P >::origin(), and ParticleData< P >::remapOutcast(). Referenced by ParticleData< P >::define(), ParticleData< P >::enforcePeriodic(), ParticleData< P >::fillGhosts(), ParticleData< P >::fixedBoxSize(), and ParticleData< P >::remapOutcast(). Referenced by ParticleData< P >::allocateVector(), and ParticleData< P >::define(). Referenced by ParticleData< P >::clear(), ParticleData< P >::define(), ParticleData< P >::fillGhosts(), ParticleData< P >::numOutcast(), ParticleData< P >::numOutcastLocal(), ParticleData< P >::numParticles(), ParticleData< P >::numParticlesLocal(), ParticleData< P >::numValid(), ParticleData< P >::numValidLocal(), and ParticleData< P >::ParticleData().